The chicken mystery remains a mystery… The hens are acting as though nothing is out of the ordinary so I guess we’ll assume that’s the case. Of course, you know what they say about assuming! 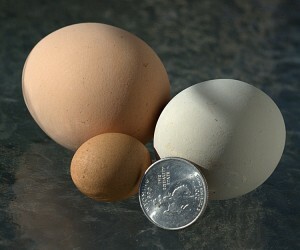 That's a teeny tiny egg next to a couple of regular eggs and a quarter! They’re laying pretty regularly for an “over the hill” group (that’d be over a year old) except for this little gift that someone left for us…what the heck is that!!? We’re continuing to see the two groups of turkeys almost on a daily basis. The toms are very impressive — quite large! And the mama turk with her group of turklings are very cute and fun to watch. The little ones are flying over the fences now. We’re wondering where she hatchted them and how long it is before the little ones can roost in the trees. She must have some great hiding spot to be outwitting the resident fox! 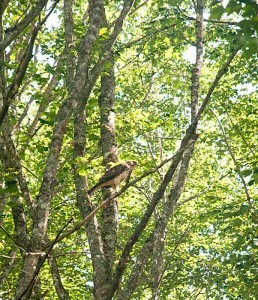 And this, folks, is the new kid on the block — a peregrine falcon. Jim spotted him sitting in the middle of our road the other day. He flew up into a tree as Jim approached — nice of him to pose for a photo. 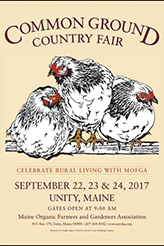 Mostly, they like to eat other birds — chickens? — but I think they prefer to hunt on the fly so maybe the hens aren’t very attractive. Fingers crossed on that one!